The Partnership or Local Action Group (LAG) works by representing the interests of its inhabitants and implementing the LEADER approach. The essence of LEADER is to improve the quality of life of a human being in the countryside, thinking about economic, social improvements and environmental preservation opportunities. 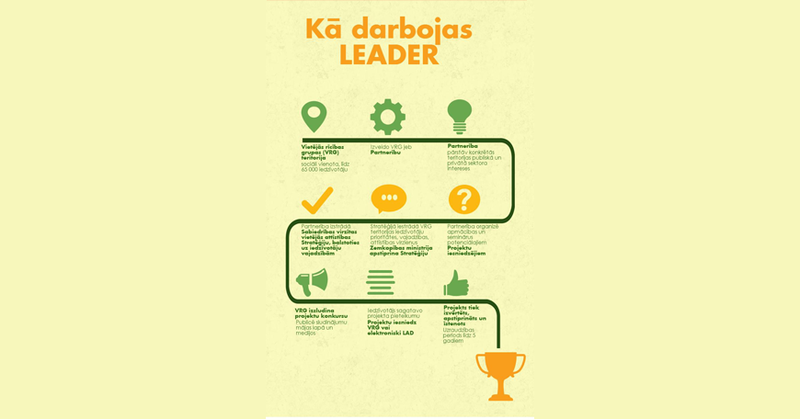 The LEADER principle is bottom-up approach when the initiative comes from local people, engaging in identifying and solving their problems, therefore, the LEADER approach is based on the development and implementation of a local development strategy to identify the needs and development directions of the inhabitants of a specific area. The vision of LEADER is a living person in a country who is able to fulfill his economic and social needs as close as possible to his place of residence. Develop a local action group (LAG) network.